Whether you're looking to pad your "End of the World" stash or just trying to cut down on your training bill, you'll find these 9x19mm rounds from Remington to be an excellent option. 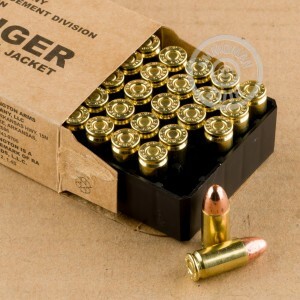 This 500-round bulk case contains American-made ammunition which is all sourced from Remington's plant in Arkansas. While the rounds were originally intended as training loads for military and law enforcement personnel, they are now available to the public a very inexpensive price. The loads make use of light, 115-grain full metal jacket (FMJ) projectiles which produce manageable recoil for range practice. In addition, the FMJs possess a rounded shape which feeds cleanly without snagging or catching. The bullets are secured in reloadable brass casings which are fitted with non corrosive Boxer primers. Remington has over two centuries of expertise to their name and has designed a wide range of guns and calibers which have spread around the globe. 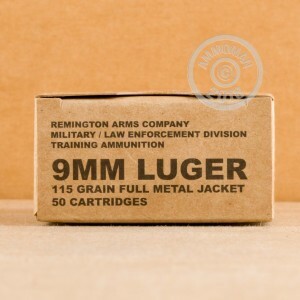 As such, these 9mm Luger rounds can be expected to exhibit consistent performance and reliability.